Started the morning with a 1 mile jog. Did another 1 mile jog in the afternoon. Then drove to the Provo Canyon. Today I decided to try a new type of workout. I was actually not quite sure what I was going to do exactly, but I had a vision. Run fast for as long as I could do it maintaining a relaxed form. Stop as soon as the muscles start tensing up, "reboot" by doing a stride downhill, then continue. I started with 15x100 strides at between 5:00-5:30 pace depending on whether I was going uphill or down, and which way the wind was blowing. This took me to the start of my rebootable tempo run at the mouth of the Provo Canyon. I started going uphill closely watching the splits and the tension in the quads. At first I thought I would only be able to make it to the mile mark. 1 mile in 5:25. I decided to go another quarter. Still feeling relaxed and maintaining good pace for the uphill (1:24). Decided to do another quarter. At the end I started feeling it was time for a reboot. 1.5 uphill in 8:12 - not bad. A short reboot, and I am going up again. Did a mile in 5:31, and right at the end of it felt the need to reboot again. Then turned around and started running downhill. Was able to feel relaxed for the entire length of the stretch - 2.5 miles in 13:17. This gave me 27:00 for 5 miles, 2.5 up, 2.5 down with two reboots. My goal is to reduce the number of reboots to 0 eventually, and still be able to run this in 27 minutes or faster. Afterwards I started doing 100 meter strides at sub 5:20 pace with 100 meters of jogging in between. It was addictive. It felt not that much harder than just jogging, but the pleasure of the speed was so great that it removed the tedium out of the cooldown. I did 31 strides, 21 uphill, 10 downhill, to give me the total of 48 strides including the two "reboot" ones (3 miles). This is a great workout. I ended up running 8 miles out of 11.5 at 5:20 average, and it did not hurt very much at all. The remaining 3.5 were probably 10:00 average physically, but a good portion of them was still 5:20 mentally - once you are done with a stride, the mind is still doing it while you jog. Did Benjamin's run, and added a bit more jogging to make the total 15 miles for the day. Ran with Eric and George in the morning. Did an acceleration (0.5 in 2:53). Then we ran their fartlek, jogged a bit, and ran a quarter in 1:25. Afterwards, George did a mile in 6:38 - a new PR. Total length of the morning run was 10 miles. In the afternoon, did my always on the run miles, and ran with Benjamin. Total mileage for the day was 13 miles. Benjamin learned to ride a bike today. I just realized that I have the privilege to be a father of somebody who ran a 25:07 5 K before he learned to ride a bike. I also have had the honor of spoon-feeding a sub-8:00 miler. One day after Benjamin ran a 7:58 mile, we were running late for church and Benjamin was taking a while eating his breakfast. To speed things up I decided to help him. Started the morning with a 1 mile jog. Then went to the temple. Came back, went to the Provo Canyon to do 12x400 down with 200 meter jog in between . Warmed up to the Canyon Glen Park, did 4x100 strides. Then started the workout running down. There was a headwind, although slightly weaker, it seemed than last week. Ran all of the repetitions very steady. Until the last one, the fastest was 68.2, the slowest 70.3 on the one that is usually the slowest - it is the only one that has a signficant uphill section ( about 130 meters), and I caught some headwind on it today for a bonus. On the last one, I decided to try the Brigham Young method again - pray as if everything depended on the Lord, then run as if everything depended on you. Everything went fine, I coasted through the first 200 in about 34.7, then shifted gears, and was amazed at the response. No siginficant anaerobic kick-back resistance. It felt like a true sprint, no fighting the lactic bear on the back. There was only one problem - my finish mark was covered with dirt and I sprinted past it. Then the lactic bear made himself known and I realized my mistake. According to my estimates, it was about 67, maybe a little under. This gives me about 68.7 average for the workout. Throughout the workout, I tried to relax the quad and engage the hamstring as much as possible, and maintain a wide relaxed stride. This had the result of relaxed running at lower speeds, being able to finish an interval not as tired as usual at the same speed. However, running harder would tense me up. Next time I should try 10x500. It felt like I could sustain the same speed a bit longer with this new relaxation technique. Afterwards, did 100 meter strides at a tempo pace. Finally, got tired of starting and stopping, and just ran a 600 in 1:55 downhill. Then ran with Benjamin and Jennifer, and went with Benjamin as he rode his bike for 2 miles. Jogged a bit more in the evening to make the total of 15 miles for the day. Benjamin has set up his Fast Running Blog. He has been keeping one for a while, but made it public tonight. Easy run with Eric and George in the morning. Did a tempo mile in 5:43. Then we did Eric and George's tempo run - Slate Canyon Loop (2.11) in 15:05. This is George's new records. After we dropped Eric off, George and I did some more accelerations. Total length of the run 10 miles. During the day did always on the run, ran with Benjamin and Jennifer, and took Joseph for a short jog in the stroller. Total mileage for the day 13 miles. Easy run with George in the morning. Did some strides. Did a couple of light ones, then 17.3 with George. Then he asked me what I could do it all out. I predicted with this type of warm-up and in training shoes it would be 15.5 on the first try. Did 15.4 and then 15.2. Then George volunteered an 8:00 pace. I encouraged him to keep it for three loops (6.33 miles). He did it, although he had to work. Did some always on the run miles, and ran with Benjamin and Jennifer. Total mileage for the day was 13. Started the morning with a 1 mile jog. Then went to the Provo Canyon around 11 am to do my marathon pace tempo run. I always wonder what I would have run for a half-marathon when I do 12, so to stop wondering I just decided to extend it to a half-marathon. Started at a magic mark before Canyon Glen Park. The trail has a mark every 1/16. This does not allow you to get a half-marathon, so I had to guess, but I figured I would not be off by more than 15 meters. Started the run uphill, to Nunns Park, then down to Riverwoods, back up, and back down finishing at Riverwoods. Weird feeling - sleepy and completely unmotivated. Hit a 6:05 mile going up, turned around, some headwind. Eventually worked my way up to 5:42 pace. Then turned around again. With some tail wind was able to sustain a slightly sub-6:00 pace going up, then turned around, and started going down into a headwind. Legs feel fine, the pace feels easy, but something is not right. When I try to pick it up, I quickly lose consentration and catch myself running 5:50. It went on like that all the way to the end to give me 1:16:43 for the 13.1. With a cooldown, I was at 16 miles. Came home, and felt very strange. Thought maybe I was dehydrated. Drank a quart of water. The stomach feels bloated, but I am not feeling any better even after a shower and a nap. Solid foods do not excite me at all - Sarah made me some lunch, and I have absolutely no desire to eat it. No motivation to do anything. Putting on my shoes seems like way too much work. Finally I remembered the word electrolytes. Drank some water mixed with sea salt, and ate some pickles. Then drank some pickle juice remembering the Russian alcoholics - in Russia pickle juice is probably the most popular cure for a morning hangover. It tasted very good, and my motivation and appetite returned. This gives me some food for thought. 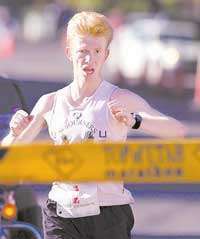 In the Top of Utah marathon of 2004 almost everybody I talked to or observed, including myself, severely underperformed. Although I did win the race, it was because there was nobody close enough to pass me at the end. I slowed down to 7:10 pace, and was shivering at mile 25. It was warm, but not enough to explain why everybody crashed. It was windy, but not terribly windy. The feelings I had in that race are somewhat similar to what I experienced today. I remember starting out, and not wanting to push the pace at all. When Demetrio Cabanillas Jr took off, I had no motivation to chase him. I've had similar feelings on warm windy days. Do those conditions deplete your sodium levels? Is there any research on that? Did another mile with Benjamin and Jennifer to hit the total of 18 miles for the day.